Around the world, journalists have expressed their support for Fairfax journalists in the wake of the company's decision on World Press Freedom Day to sack 25 per cent (1-in-4) of its editorial staff from its metropolitan newsrooms in Sydney and Melbourne. In a particularly poignant gesture, the courageous Journalists' Union of Turkey, which is confronting a government purge of the media that includes the arrest and detention of more than 100 journalists and the closure of dozens of media outlets throwing hundreds of journalists out of work, has offered its support and solidarity to Fairfax journalists. Messages of support from around the world have been flooding in. Sharan Burrow, general secretary of the International Trade Union Confederation in Brussels, said: "We were shocked to hear of the unilateral and deeply damaging plan of Fairfax management to cut 125 full-time equivalent jobs, at a time when the world is crying out for quality journalism to combat the lies, distortions and fake news which are driving xenophobic, nationalistic and extremely dangerous political narratives. On behalf of the International Trade Union Confederation, representing 181 million trade union members worldwide, I wish to join with the International Federation of Journalists in expressing our total solidarity with your action. We are witnessing a closing of democratic space around the world, and the exercise of free speech and good journalism are vital to democracy itself. The decision of Fairfax management is wrong and misguided, and the international trade union movement stands with you every step of the way in your campaign to reverse it." Tim Dawson, president, and Seamus Dooley, acting general secretary, of the National Union of Journalists - UK and Ireland, said: "We learned with great concern of the decision of Fairfax Media to enforce sweeping redundancies at the Sydney Morning Herald, the Age and the Australian Financial Review. The axing of 125 jobs will have a devastating impact on the workers and their families. The proposed cuts will severely damage the titles at a time when editorial investment is crucial to retaining audiences. On behalf of NUJ members in the UK and Ireland we extend solidarity to your members and congratulate you on the swift response to the announcement of unilateral action on the part of the company. We wish you will well in your strike action and assure you of our strong support. The Federation of Journalists Associations of Spain and the Spanish Federation of Journalists Unions said: "As Spaniards we always thought that Australian people were our antipodeans, but after receiving the news about the drastic plan to suppress 125 jobs in Fairfax Media, we feel ourselves very much identified with our colleagues of the Sydney Morning Herald, Age and Australian Financial Review. The brutality of the mentioned plan has to be called off because quality and free journalism continue to be an important tool of pluralism deserving a real and true democracy. On 3rd May, the World Press Freedom Day, we support the strike of Australian journalists struggling for their right to negotiate any possible alternatives to that savage jobs’ cut. The Belgian Association of Professional Journalists (AJP) "supports the Fairfax journalists in their protest against the drastic cut of 125 jobs and the threat to the quality of their work!" The Swedish Union of Journalists: "To our colleagues at Fairfax Media, Australia: We support Your fight for decent work and conditions! In solidarity." The Independent Media Trade Union of Ukraine: "Our trade union expresses its solidarity with the journalists at Fairfax Media (Australia) who went on strike against 125 proposed job cuts. We call on management to find alternate savings." The National Union of journalists of Ukraine: "The (NUJU supports our colleagues from Fairfax Media in protest at the drastic cut of 125 full-time jobs." The Journalists Union of Turkey: "It is quite right for journalists to defend quality journalism and the staffing levels it requires. The Türkiye Gazeteciler Sendikası sends full support to our MEAA colleagues on strike at Fairfax Media." The German Federation of Journalists: "Dear Colleagues at Fairfax Media! We are with you in spirit. We feel solidarity with you. Keep fighting for your jobs and rights and for fair conditions. We keep our fingers crossed for you." Unifor, Canada: "To the striking journalists at Fairfax Media, Unifor sends its solidarity. With more than 12,000 journalists and media workers in newspapers, television, magazines, news websites and film production, we are Canada’s media union. Like you, we have felt the pain of massive job cuts as journalists – and ultimately our readers and viewers – pay the price for management decisions. Like you, our democracy is threatened by every job loss and every voice silenced that might hold power to account. Your struggle is our struggle, and we are with you." The National Syndicate of Journalists of Tunisia: "Cher collègues, cher camarades. Au nom de l'ensemble des journalistes en Tunisie, le Syndicat National des Journalistes Tunisiens (Snjt), affirme son soutien inconditionnel aux collègues de FairFax Media suite à la décision de licencier 125 emplois, le jour de la liberté de la presse. Notre Syndicat réaffirme son soutien à votre action de grève, un acte de militantisme en vue de protester contre le licenciement des journalistes. Votre combat est "juste" et "précieux", celui de votre droit pour l'exercice de votre métier. Le Snjt, mobilisera ses forces pour sensibiliser les collègues Tunisiens en solidarité avec votre combat. Votre combat est le notre. Unis, nous ferons la force. Bon courage!" Syndicom, Switzerland: "Dear colleagues, Through the International Federation of Journalists IFJ, we read about the strike of the journalists at Fairfax Media Australia. On behalf of syndicom, the Swiss union of media and communication, we would like to express our solidarity to the colleagues on strike.The announced massive dismissal of 125 journalists full-time jobs at the newsrooms of the three newspapers Sydney Morning Herald, the Age and the Australian Financial Review is a drastic cut in the media staff which endangers the quality of media in Australia. The fact, that the management refuses to negotiate with the staff representatives and the involved unions shows a harsh lack of social responsibility. In Switzerland, we experienced similar situations since 2009, when the biggest Swiss newspaper and online media editor Tamedia sacked a quarter (25%) of its staff at the Newspapers Tages-Anzeiger and Der Bund (including editorial staff and fix freelancers) - without accepting the journalists propositions to reduce the loss and without a decent social plan. Still, a strike wasn’t possible, but the staff and participating Unions managed to make pressure with public actions and demonstrations, so that the management had to accept to negotiate considerable improvements in the social plan, with additional payments for the fired staff and fix freelancers. It is worth to fight for decent worker rights! We congratulate the striking staff for your collective courage and send our solidarity to your movement!" CWA Canada: "Dear brothers and sisters, CWA Canada and the 6,000 media workers we represent stand shoulder to shoulder with you as you fight to protect jobs and journalism. The loss of 125 jobs at Fairfax Media would be a huge blow not only to journalism but also to democracy. It means 125 less journalists telling the stories that matter to Australians and holding politicians and corporations to account. At a time when journalism is under attack around the world and fake news is proliferating, we need more professional journalists to defend democracy, not less. Keep fighting the good fight!" The Russian Union of Journalists: "Dear colleagues and friends, The Russian Union of Journalists (RUJ) welcomes your decesion to go on strike and fight for the rights of our fellow journalists of Fairfax. On behalf of RUJ Board I wish you to continue the fight with drastic cuts of jobs until the total victory. The RUJ as the member of the global IFJ family believes that international solidarity can be a useful tool in such kind of struggle, so you can count on us and any our support that we can provide. In solidarity." NUJ, Nepal: "We, NUJ-N, stand with the staffs of Fairfax and MEAA against the cutting series of positions at Fairfax." NUJT, Thailand: "n name NUJT, we support Australian journalists help to demand fairness for 200 media labors of Fairfax. Media workers should not bear result from faulty management of a media owner. We hope all our friends in Australian win." Palestinian Journalists Syndicate: "This is to confirm the strong support and solidarity of the Palestinian Journalists Syndicate (PJS) with the Sydney Morning Herald, the Age and the Australian Financial Review journalists in their protest against the Fairfax Media company management’s decision to cut of 125 full time jobs. PJS is fully support the journalists strike. In solidarity"
Nepal Press Union: "We strongly condemn the announcement of Fairfax. We are with MEAA and its members. Our solidarity to The IFJ and MEAA upcoming movement. We also demand restore of all 125 journalist." The Media Asosiesen blong Vanuatu: "We are giving our firm support to Fairfax and sending you its solidarity to its journalists. As we are just celebrating the World Press Freedom Day, MAV as an affiliate member of IFJ and beneficiary from the work of disseminating information through largest media companies like the ones in Australia, we give all our support." The Afghan Independent Journalists Association: "We stand in solidarity with our Australian colleagues. Independent and quality journalism is vital for press freedom to flourish, yet these cuts will impact on the future of this at Fairfax." Free Media Movement - Sri Lanka: "We are in solidarity with the collective decision by Fairfax media comrades to fight for the rights of their colleagues. It was a shame to hear this on the World Press Freedom Day, however, the collective action you have taken to fight for rights of media freedom and journalists' rights is an example for the rest of the world. It is our pleasure to hear that. May your fight win! May the rights of media comrades are protected!" South East Asia Journalists' Union representing Aliansi Jurnalis Independen - Indonesia; Cambodia Association for Protection of Journalists; National Union of Journalists of the Philippines; National Union of Journalists, Thailand; Myanmar Journalists Association; Timor Leste Journalists Association; and the Timor Leste Press Union: "We, the South East Asia Journalist Unions (SEAJU), write to express our concern over the cutting of 125 editorial positions at Fairfax and the dire impact it will be have on journalism in Australia. The tragedy of the announcement coinciding with World Press Freedom Day, May 3, is not lost on the global community and is of particular concern for journalists in South East Asia. At a time when media companies should be investing and protecting journalism in this time of post truth, such a cut can only be devastating to the state of media freedom and diversity in Australia. As we mark World Press Freedom Day in Jakarta with hundreds of journalists, media workers and activists from across the world, the messages have been clear. 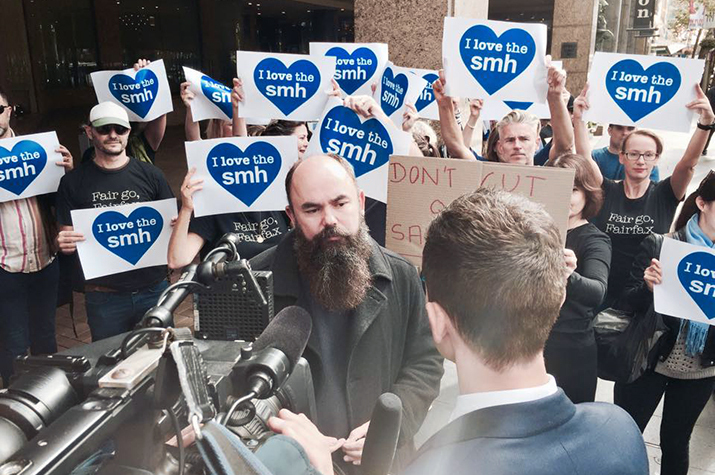 Independent and quality journalism is vital for press freedom to flourish SEAJU stand in solidarity with Fairfax journalists as they protest this unthinkable move that strikes at the heart of quality journalism that has been respected across the region." NUSOJ - Somalia: "The National Union of Somali Journalists (NUSOJ), an affiliate of the International Federation of Journalists (IFJ), declares its total solidarity with members of the Media, Entertainment & Arts Alliance (MEAA) who are on strike. NUSOJ is disappointed by the decision of the management of Fairfax Media who announced its intentions to cut a quarter of all newsroom jobs. Striking journalists are facing intransigent management who could already have reached an alternative solution, but chose to put their profits before the journalists and the future of journalism. Cuts and dismissals are not the way to go. NUSOJ has called on all its sister unions in Eastern Africa to give the striking journalists their full backing and to be ready to mobilise solidarity action should a settlement not be reached. Media workers’ withdrawal of labour in an employment dispute is the only weapon they have. In solidarity." SNJ-CGT - France: "Dear colleagues, we just heard about the strike of Journalists at Fairfax Media against a quarter of all newsroom jobs cuts. The French Union of Journalists (SNJ-CGT) wishes to support your action. In France the editors are reducing everywhere they can the number of journalists. Precarity is growing, salaries are frozen, conditions of work are deteriorating and finally the quality of information is falling down. The concentrations of media are reducing the pluralism when big international companies are controling the majority of medias in our country and in many others in Europe. We hope you will win this struggle and stop the redundancies." Journalists’ Union of the Athens Daily Newspapers: "JUADN Executive Board send message of support and solidarity with Australian colleagues striking in newspapers ‘Sydney Morning Herald’, ‘The Age’ and ‘Australian Financial Review’ to preserve 125 colleagues jobs and newspapers’ prestige guaranteed by the quality of journalists work. Athenian media journalists hit hard during the seven years of our country’s economic crisis facing 50% unemployment and work with no pay, state that news information is a privilege and editorial independence requires full employment and social security rights." Delhi Union of Journalists (DUJ) - India: “The Delhi Union of Journalists (DUJ) condemned reports that 125 editorial positions were cut by Fairfax recently. It has also supported the seven days strike by Fairfax. It may be recalled that Fairfax is one of Australia's largest media outlets - Delhi Union of Journalists. Le Syndicat National de la Presse Marocaine (SNPM) - Morocco: "Le Syndicat National de la Presse Marocaine (SNPM), exprime toute sa solidarité avec les journalistes de Fairfax Media Australia , qui vont commencer une grève d'une semaine pour stopper le licenciement de 125 journalistes, au Sydney Morning Herald, the Age et the Australian Financial Review. Notre syndicat considère que ce licenciement abusif est un acte qui ne peux pas être justifié sous aucun prétexte, et qui affecte la vie des journalistes licencié et de leurs familles. En plus il est contre la loi du travail et des engagements sociaux et légales des entreprises. Le SNPM demande l annulation des mesures de licenciement et d entamer un dialogue avec les représentants des journalistes pour le respect de la loi et la dignité des travailleurs." The Indian Journalists Union: "The Indian Journalists Union condemns the decision of the Fairfax management and expresses solidarity with the striking journalists. The move by the management smacks of short sightedness and is an assault on good and independent journalism. Don’t compromise on quality and credibility of your media, it’s a bad call, take it back, the IJU would like to caution the management. At the same time, we wish the striking journalists and MEAA all success. Long live unity!